Gigabyte reveals BRIX, a new line of ultra compact PCs that promise uncompromising performance in a small footprint. BRIX measures 29.9mm x 107.6mm x 114.4mm and is available in four configurations, the fastest model has an Intel Core i7-3537u dual-core processor. Other features include SSD storage, WiFi, USB 3.0 an dual-display support. The product is sold as a DIY kit, SO-DIMM memory and a mSATA SSD need to be installed by the user. GIGABYTE TECHNOLOGY Co. Ltd., a leading manufacturer of motherboards and graphics cards, is proud to present today the GIGABYTE BRIX, an ultra compact PC, combining an incredibly small and sleek form factor chassis design with a choice of high-performance Intel® Core™ processors, fast SSD storage, integrated Wi-Fi, USB 3.0 plus dual digital display outputs. The BRIX from GIGABYTE is an ultra compact (29.9 x 107.6 x 114.4 mm) and versatile DIY PC kit available with a broad choice of processors covering a range of performance and price points. Redefining the desktop PC in terms of miniaturization with a form factor that sits in the palm of your hand, the BRIX doesn’t hold back in terms display and peripheral connectivity, or raw performance, and is ideal for compact HTPC builds, as a standard desktop in the home or office, or in commercial applications such as digital signage. 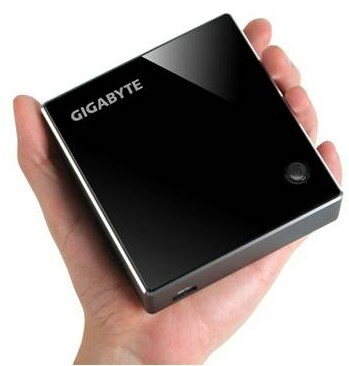 GIGABYTE designed the BRIX to be smaller and lighter than currently available products, with a stylish glass surface mounted on an anthracite aluminum frame. The BRIX comes complete with a GIGABYTE compact form factor motherboard, Wi-Fi module, VESA mounting bracket and power adapter, requiring only an mSATA SSD, SO-DIMM memory and OS. The BRIX is available with a choice of four power-efficient, 3rd Generation Intel processors. From a simple internet access point, to a high-end multimedia station, the GIGABYTE BRIX offers great flexibility for a wide range of different usage applications. With support for HDMI and DisplayPort, the BRIX can power two displays simultaneously, making it a perfect choice as a high-productivity PC in professional and home environments, or in any number of industrial and commercial multi-display applications. The BRIX is sold as a DIY PC kit, shipping with a Wi-Fi Mini PCIe module pre-installed, plus a power adapter and cable conforming to local standards. Requiring only SO-DIMM system memory and mSATA SSD, the BRIX gives users the flexibility to independently choose integrated storage and system memory sizes, without the trouble of sourcing components that are not widely available on the retail market. Bundled with a VESA bracket, the BRIX can easily be mounted behind a monitor or HDTV making it discreetly hidden from view. This offers a simple and elegant way to turn any VESA-compliant display or TV into a full-featured PC or digital signage unit.